Obamacare expanded Medicaid to cover more Americans, but Republicans say the program for the poor is too costly. Signed into law by President Lyndon Johnson in 1965, the program originally covered four main groups of those without the means to pay for medical care: children, pregnant women, people with disabilities, and elderly people needing long-term care. In 2014, the Affordable Care Act allowed states to expand Medicaid to cover able-bodied adults earning up to 138 percent of the federal poverty level ($16,394 in 2016). That helped add nearly 17 million people to the rolls in 31 states (plus D.C.), and brought the number of Americans covered under Medicaid to 74 million, including the Children’s Health Insurance Program. The expansion played a major role in reducing the number of Americans who don’t have health insurance from 14.3 percent in 2013 to 8.6 percent last year. But the cost of providing this coverage was steep: The state and federal governments spent $574 billion on Medicaid last year. Republicans say the trajectory of growth in the program is simply “unsustainable,” setting up a major struggle over Medicaid’s future. “I think there will be an incredible tug-of-war,” said Rep. Mark Sanford (R-S.C.). What do Republicans want to do? In legislation that House Republicans passed and sent on to the Senate, GOP leaders proposed phasing out Medicaid expansion by 2020 and reducing projected spending on the program by $834 billion over a decade. That bill, called the American Health Care Act, would cut $875 billion in taxes, mostly on high earners, that are being used to pay for Obamacare. Republicans want Washington to give states limited amounts of money for Medicaid, based on either a block-grant or per capita formula, letting states figure out how best to spend it. The Congressional Budget Office estimated that the Republican plan would ultimately insure 14 million fewer Medicaid recipients than the current law. Senate Republicans are rewriting the House bill, and Medicaid is reported to be a major sticking point. Moderates have proposed a phaseout of Medicaid expansion over seven years instead of three, to soften the blow on recipients—and delay the political consequences for Republicans. How well does Medicaid work? Not surprisingly, Republicans and Democrats disagree on that topic. Republican critics call the program bloated, rife with fraud, and inefficient, and say its low payments to doctors result in inferior care. They often cite a 2013 study that compared a group of low-income Oregon residents who were on Medicaid with those who weren’t; the study concluded that Medicaid “generated no significant improvement” in measured physical outcomes for diabetes, high cholesterol, or high blood pressure, or even for mortality rates. Medicaid patients did show “substantial improvements in mental health”— at least partly because they knew they could see doctors without crippling out-of-pocket costs. But other Medicaid studies have concluded the program does improve overall health. A Harvard study found a “significant” 6 percent decrease in mortality in the affected population in states that expanded Medicaid, compared with those that didn’t. 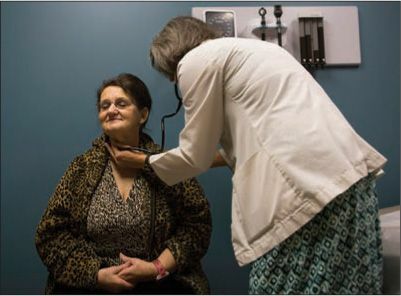 The nonpartisan Kaiser Family Foundation says that its review of the research shows that Medicaid recipients are as likely as privately insured adults to have doctor visits, specialist care, and preventive screenings, and that 85 percent are satisfied with their medical care. “Research shows consistently that Medicaid improves access to care,” says Kaiser analyst Julia Paradise. Democrats warn that the Republican plan to cap Medicaid spending would force states to ration health care for the poor and cut benefits to disabled, mentally ill, and elderly people. They also contend that limiting Medicaid spending could create a crisis for nursing-home care. Does Medicaid fund that care? Medicaid covers home health aides and nursing-home care once a patient’s own savings are exhausted. More than 60 percent of all nursing-home residents are currently covered by Medicaid, and such care consumes 21 percent of all Medicaid spending. In coming years, the need for nursing-home coverage will almost surely grow dramatically, as Baby Boomers age and people live longer. The government estimates that about 70 percent of Americans will require long-term care. Some 80 percent of those will rely on home health aides, at an average cost of $46,000 annually. About 18 percent will receive care in a nursing home, where the cost of a semiprivate room averages more than $82,000 a year.